The contact lens is an item used by millions of people across the globe. This is thanks to its dramatic evolution from a 16th century notion to a 21st century optical solution. If you want to see a bit more clearly but you don’t like glasses then your choice must be the humble contact lens. There are lenses available today that you would barely notice you’re wearing. A contact lens is a convenient and comfortable way to correct your eyesight, but this was not always the case. The introduction of the idea of a contact lens is often credited to perhaps the most prolific inventor of all time: Leonardo DiVinci. In his work of 1508 entitled Codex of the Eye, Manual D, he wrote about a way of enhancing the power of the eye by submerging it in a bowl of water. Although he did not suggest this as a means of correcting poor vision, his idea had started a ball rolling. The first idea for a corrective lens came from Rene Descartes in 1636. He suggested that a liquid-filled glass tube be placed directly on the cornea; however his idea failed as if someone tried to wear such a device they wouldn’t be able to blink. English scientist Thomas Young took the contact lens baton and in 1801 developed a liquid-filled eyecup fitted with a microscope eyepiece. However, he could not find a way to correct the refraction that occurred in vision due to the liquid in the eyecup – back to the drawing board. The first device that can be called a contact lens was built by German ophthalmologist Adolf Fick in 1887. They were not completely unsuccessful but were far from comfortable as they were made from glass and they could subsequently only be worn for a couple of hours at a time. These lenses were known as afocal scleral contact shells and they rested on the rim of tissue around the cornea. Glass-blown scleral lenses were the only type of contact lens available until the thirties when optometrist William Feinbloom created plastic lenses which were lighter and less cumbersome. The first corneal contact lens was created at the end of the 1940s which could be worn for up to 16 hours a day and by the 1960s the contact lens found mass appeal. However, lenses were still fairly fragile and expensive and oxygen could not permeate the surface which could lead to a number of clinical problems. 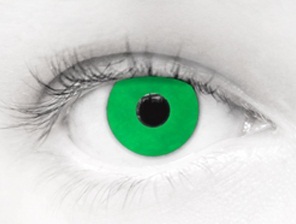 Since the sixties polymers have been used to create a contact lens that is permeable to oxygen. Today silicone hydrogels are used to make lenses that are extremely comfortable and effective, and progress continues to be made, as is evident with Ilense coloured contact lenses and other amazing ocular innovations.